Asteroid Cruithne has a very peculiar horseshoe orbit which is difficult to describe in words. 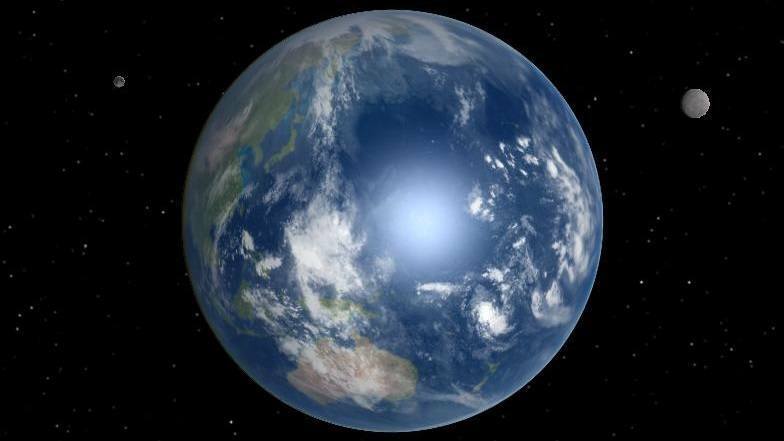 Some have called it Earth’s second Moon. The lunar association is also strong in the name of this asteroid. The Cruithne were a peculiar race from ancient Scotland, who the Romans termed the Picts because their bodies were covered in tattoos. The Pictish Nation had a matrilinear culture where the women passed on the family name, they were warriors and goddess worshipers. We really don’t know a lot about this mysterious culture because they left no writing, just the strange symbols on the standing stones. Astrologer Lynn Koiner has done some research and belives that Cruithne “brings an internal transformation through seeking one’s roots and our rootedness to this planet”. I’ve been interested in this asteroid for a while as I have Scottish ancestry and have been very interested in researching this wonderful ancient culture. Tonight I had the urge to write about it, and discovered that transiting Cruithne was on my Moon (10 Virgo). In my natal chart Cruithne is conjunct my Chiron and IC. I would also expect asteroid Cruithne to have some association with the warrior goddess archetype and also the occult, as these were a dark and mysterious people. There is some evidence of this association in the discovery chart. I do wish I could have found the exact time, but that seems as elusive as this culture. Chiron with Lilith is a magical conjunction, dark too, hard to fully understand. 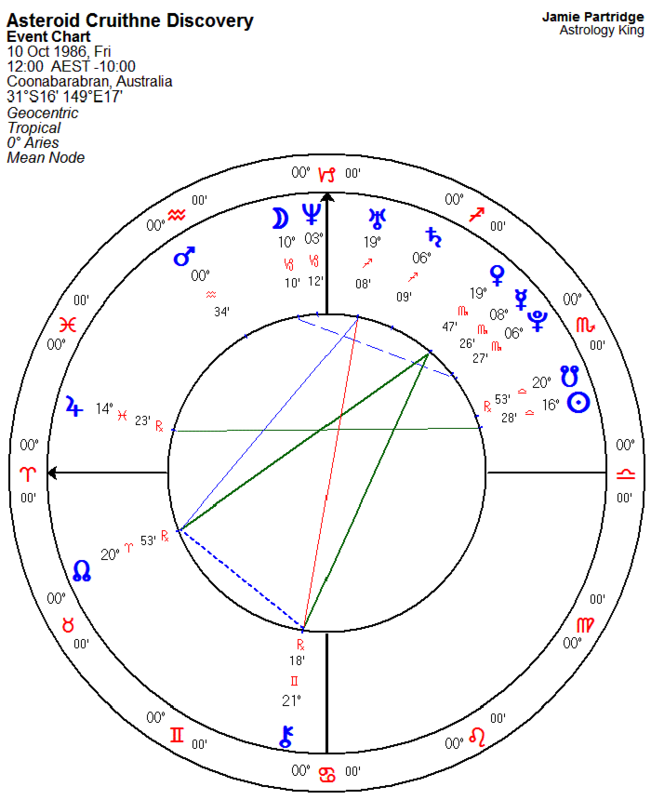 The feminine is the focus in this chart with Venus as the action point of a Yod aspect pattern. Venus on the fixed star Zubeneschamali which “will arouse, above all things, spiritual and mental forces”, and with Venus gives social success and help from women. This is very apt for a culture whose social system was ruled by strong and spiritual warrior queens. The interest in our roots as mentioned by Lyn, can be seen with Chiron sextile North Node as part of the Yod. Chiron describing the healing journey, and the Nodes represent our ancestral heritage. Yods do denote a spiritual warrior energy, in this case strongly feminine with Venus, and definitely the warrior queen with Chiron on the fixed star Bellatrix,, the Female Warrior star”. The Cruithne were like all indigenous cultures, closely in tune with their mother Earth. They were also fierce warriors living at the fringe of the world, even the Roman Empire could not tame them. Eventually the Pictish Nation fell from a series of invasions, the culture was lost, and the people dispersed around the globe. 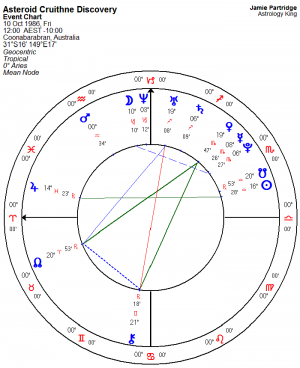 The North Node in that chart is on a star called Baten Kaitos, “compulsory transportation, change or emigration, misfortune by force or accident” . 3. In “additional asteroids or hypothetical planets”, add 3753.